Refers to that monster's traits that vary by level. Level 1 and level 99 trait values are provided mainly to give a general idea of a monster's statistical growth, especially in relation to other monsters in its class. HP (Hit Points) indicate the maximum damage the monster may receive before it dies. MP (Magic Points) are not used by monsters. AT P (Physical Attack) indicates the strength of physical monster attacks. AT M (Magic Attack) indicates the strength of non-physical monster attacks. Since many monster abilities are non-physical in nature, this value is usually much higher than those of human units. Speed affects the frequency of the monster's battle turns. The Abilities column lists the names of the abilities that the monster is capable of using. Italicized names of abilities (the last ability listed) indicate that the ability is available only when the monster is adjacent to an allied human unit that is equipped with the Squire's "Monster Skill" support ability. The Description of each ability is taken directly from the game. Certain abilities may inflict a status (Add), nullify a status (Cancel), and cause elemental-based damage. Supplemental information not provided by the game's description is enclosed in square brackets. The Range parameters specify the area in which the monster may execute the ability. The first value is the maximum number of panels away from the monster's position. The second value, denoted by "V," is the maximum height from the monster's position. It limits the first value. "4-dir" limits the first value to the panels to the monster's front, back, and sides. The ability has no actual range. The ability's effect field is centered about the monster's position. The Effect parameters specify the ability's effect area. The first value is the maximum number of panels away from the ability's "center" of execution. This value sets the outer limit of the ability's effect area. The second value, denoted by "V," is the maximum height from the ability's center of execution. This value also sets the outer limit of the ability's effect area. The ability affects only one unit. The targeted unit may only be an enemy. "3-dir" limits the first value to the panels to the monster's front and sides. Refers to traits that are inherent in the monster. The Move value is the maximum number of panels a monster may move during its turn. The Jump value is the maximum height that a monster may climb or descend during its turn. C-EV Phys. is a truncation of "Physical Class Evade." It is the percent chance that the monster will evade a normal physical attack successfully. 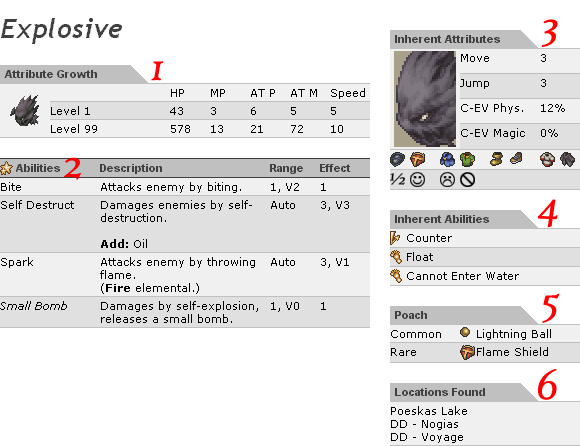 Absorb Damage caused by elemental attack is absorbed completely; the monster gains HP equal to the damage value. Weakness Damage caused by elemental attack is increased by 50% of the original damage value. Half Damage caused by elemental attack is reduced by 50% of the original damage value. Refers to the secondary (non-action) abilities (and disabilities) that are inherent in the monster. For monsters, secondary abilities consist of reaction and movement abilities. All monsters have the "Counter" reaction ability and many monsters are unable to enter water ("Cannot Enter Water" movement disability). When a human unit equipped with the Thief's "Poach" support ability (otherwise known as "Secret Hunt," an English mistranslation) kills a monster with a normal physical attack, the monster's remains disappear immediately from the battle. (Therefore, the monster cannot be revived.) The monster has been successfully poached and its remains are processed to create one of two items, which may be purchased at fur shops in any "trade city" (such as Dorter Trade City). Both allied and enemy monsters may be poached. The common item is usually created from the monster's remains. However, there is a one-in-ten chance that the rare item will be available for purchase. To purchase items at the fur shop, at least one unit in the immediate party must be equipped with the Poach ability. Refers to the locations of random encounters (in Chapter 4 only) in which the monster may appear. "Common" enclosed in parentheses next to a location name denotes areas in which the monster tends to appear frequently.